During his commencement address on Mother’s Day at the DCU Center in Worcester, Governor Charlie Baker told Nichols College graduates that his mother has “never complained” during her struggle with Alzheimer’s disease. 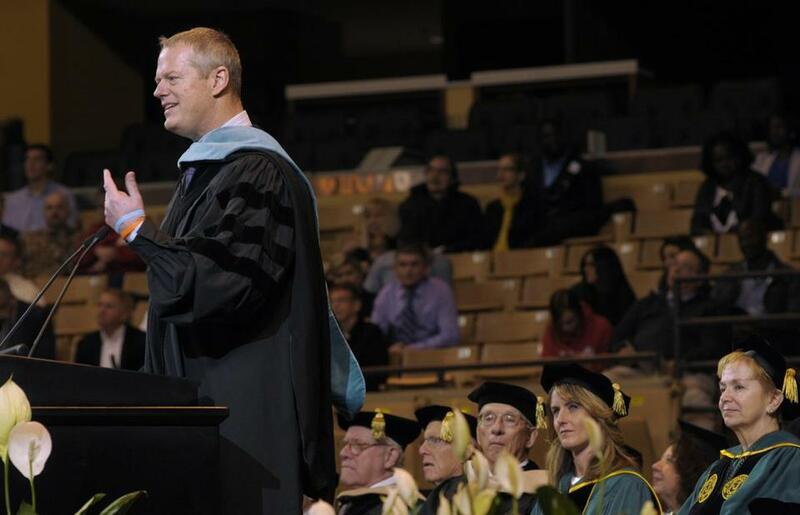 WORCESTER — In an emotional commencement address, Governor Charlie Baker urged Nichols College graduates Sunday morning to remain positive during times of adversity, citing his mother’s bravery while struggling with Alzheimer’s disease as an example of such grace. “Be constructive, be positive, and try to focus on what works instead of what doesn’t,” Baker said during his 15-minute address at the DCU Center. Baker, noting that the graduation fell on Mother’s Day, turned to his mother’s battle with Alzheimer’s, a devastating form of dementia that worsens over time, to illustrate the point. He said she was first diagnosed with the condition about 10 years ago and now lives in a facility where she receives round-the-clock care. As the symptoms began to take hold, Baker said, “mom never complained,” instead telling her family how much she appreciated them. Baker took a lengthy pause and fought back tears as he described his father’s initial response to the diagnosis. The governor, who has made news as one of the many establishment Republicans voicing opposition to Donald J. Trump, the party’s presumptive nominee for president, generally steered clear of current events during his speech. But he did say at one point that “it’s pretty easy to let the stuff that doesn’t work weigh you down” and then listed “presidential politics” among a litany of things that can discourage people. He also discussed a setback in his political career, when he lost a hard-fought gubernatorial election to the then-incumbent, Democrat Deval Patrick, in 2010. Baker recalled that soon after the defeat, a young man called him and asked if he would speak at a robotics conference in Boston. Nichols, based in Dudley, focuses on business education supported by a liberal arts curriculum. It conferred 325 bachelor’s degrees, 128 master’s degrees, and four associate’s degrees to students Sunday. The procession of graduates began marching down the center of the auditorium around 10:20 a.m. Clad in dark-colored caps and gowns, they beamed as thousands of family members and friends cheered from the stands and a brass band played “Pomp and Circumstance,” the traditional accompaniment to commencement processions. Sean Hoey, the senior class president who received a degree in international business and finance, urged his friends to future successes by channeling the rallying cry of Bill Belichick, the New England Patriots head coach known for telling his players to “do your job.” Hoey repeated the mantra several times during his speech, and Baker and other dignitaries on stage mouthed the phrase behind him. Baker returned to the theme during his address, repeating the phrase himself a number of times while also telling the Class of 2016 to take healthy risks.